The Rand Corporation recently released a report, The US-China Military Scorecard. The report assessed US and Chinese military capabilities in the context of two scenarios at different distances from China, one centered on Taiwan, and the other on the Nansha Islands. According to the report, over the past two decades, the PLA has transformed itself into a capable, modern military. In the 1990s, US strengths were evident, but now China enjoys an advantage in most plausible Asian conflict scenarios and US operational advantages in more distant scenarios are being undermined. Global Times reporter Chen Chenchen interviewed the lead author of the Rand report and experts from China and its neighboring countries to provide perspectives on China's rising military power and consequent geopolitical effects. I would expect for the immediate future that the PLA would continue to improve, and that the gap between US and Chinese capabilities will continue to narrow. But the US has enormous residual strengths. So at a minimum there will be a balance for many years to come. The long-term picture really depends more on the future of the Chinese and US economies, and especially on whether reforms in China are successful. I really want to emphasize here that there is a larger purpose of the report that goes beyond who's gaining or losing ground. The primary purpose was to provide a baseline for leaders in the US and in the Pacific to include China to make better decisions. In my view, the US and China should not work towards some kind of a so-called G2, or combined dominance of Asia. Unless Japan, Korea and smaller countries of Asia have their voices and interests represented, it will be hard to maintain any kind of a stable peace. My chief concern, and one we highlighted in the report, is that the military relationship could become more competitive if it's not handled well. Certain types of weapons, certain types of military strategies, and certain types of military activities can lead to structural instabilities. They can lead to situations in which even if neither side wants conflict, both sides might see advantages to striking or attacking first if they think war is highly likely or inevitable. So the need for discussions on these sorts of issues, on military weapons and strategies has grown over time, and I think, will continue to grow in the future. The US government usually always exaggerates the strength of its adversaries or rivals to maintain their huge defense budget as global policeman and to maintain Pax Americana globally. The objective is always to maintain total superiority. maintains the superiority in the technology of their weapons. They also have the edge in the global deployment of US military forces in various global commands like the Pacific Command, European Command, Southern Command, Africa Command, Space Command, etc. The recent display of China's military prowess during (the military parade commemorating) PRC's victory against Japan will further enhance an arms race with the US as well as with other Asian countries. That display of PRC's military force has also been used by Japan to finally pass its law to expand the coverage and functions of Japan's self-defense forces. In the next 10-15 years, the arms race between the US and China will intensify, but of course, the US will be constrained by weaknesses of its economy in further increasing its unrivalled annual defense budget. The increasing military strength of China will only lead to the strengthening and long-delayed modernization of the external defense capabilities of the armed forces of the Philippines. It will also strengthen US-Japan-Philippine security relations and where the Philippine government will invite US and Japanese forces to use Philippine territory as military base. This is the outcome of the perceived aggressiveness of its neighbor, China. I think the new Rand report into the development of China's military power and its relations to the US military is a very significant document. It's correct in its conclusion that China's aggregate military capabilities are still below America's, but that China's very significant enhancements in particular capability areas have made a decisive difference to the military balance between the US and China in the Western Pacific. I think what it really means is that China is now in a position to raise the costs and risks to the US of projecting power into the waters around China. I think this makes the fundamental difference to the military balance between the two countries in the Western Pacific. I think that's really important because the military foundation of US strategic primacy in Asia has always been America's capacity to project power by sea into the Western Pacific. As China's capacity to stop America doing that grows, the military foundation of the US primacy in Asia is eroding. I think that has huge implications for the whole way the region develops. It doesn't mean Australia needs to feel threatened by China's capacity to project power by sea itself, because as the Rand report makes it clear that China's capacity to project power by sea over long distances remains rather low. And it brings closer to the time in which Australia will start having to think what kind of order in Asia it would like to see emerge in the time when the military capabilities between the two countries are more evenly matched. The gap between the US and China in the military domain has come down. The Chinese higher growth rate, larger economy meant that it is able to devote a larger proportion of its expenditure, of its resources, into military modernization. Other countries are getting more anxious about China's military power, China's growing postures which have not been particularly confident and reassuring in a sense. So other countries are also trying to do catching-up game with China, which essentially boils down to some sort of military competition between China and other powers in Asia, the major and even the smaller powers in the Asia-Pacific. India likely will be concerned about these developments, the growing Chinese military power, and India has not been able to respond in an appropriate manner. India has had its own issues, there are several internal security issues, internal economic issues. The fact that India still lacks an effective industrial manufacturing base including in the defense sector has meant that India still continues to look at foreign procurement and that's the mainstay of India's defense preparedness. Something like 70 percent of India's defense capabilities are done through foreign procurement. So India will continue to be concerned, but unless it gets its house in order, it's unlikely India will pose any sort of challenge in the coming years. I think despite the latest findings by the Rand report that the gap between the US and China in terms of military capability is narrowing, both countries should not fixate themselves too much on comparing the relative military strength. This is no more a world whereby we are experiencing Cold War. This is instead a world where we are experiencing acute economic slowdown. 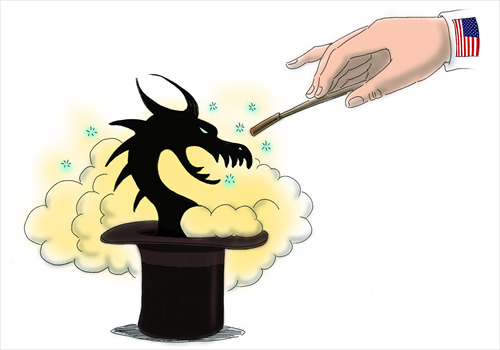 China, as the world's largest economic locomotive, if not the world's largest economic power, should continue to focus on harnessing its national will in developing both its own as well as the world's economy. The US, on the other hand, should recognize that China indeed is a rising power, and is not to be taken lightly, so it should engage China in terms of, for example, cooperative efforts, such as cooperation in counter-terrorism where both countries are major victims. As well as the Southeast Asian countries, we have to recognize that China is indeed a major regional power to stay, and we too have to very proactively engage China especially economically to deeper economic cooperation with China, so as to sort of promote more understandings between both sides, and thereby avoid misunderstandings especially in military terms. We should also help China harness its growing military power in, from our point of view, in more productive areas such as anti-piracy and humanitarian efforts.